What is tummy time, and why is it important for infants? « Howard J. Bennett - Pediatrician and Author in Washington, D.C.
What is tummy time, and why is it important for infants? Now that babies sleep on their backs, it’s important for them to get tummy time throughout the day to help strengthen the muscles in their arms, neck, shoulders and back. I usually recommend that parents start tummy time when babies are 4 weeks of age. You could do this sooner, but I figure parents have enough things to worry about in the first month without putting tummy time on their list. 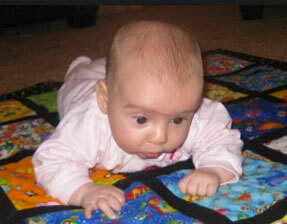 There is no “right way” to do tummy time, but it makes sense to do it when babies are alert. First, put the baby tummy down on a firm surface like a couch, bed or the floor. If possible, lie down next to the baby, which will encourage her to look up and see your face. If the baby is fussy, you can help support her upper body by pulling her elbows in to her sides. If you smile and talk to your baby, she will be more likely to work her muscles to make tummy time a success. If your baby is still fussy, try putting her on a slant to make it easier to look up. The best way to accomplish this is to put her on her father’s chest while he is lying at a 30-degree angle. Do tummy time for 5 to 15 minutes a handful of times during the day and evening. Obviously, how long tummy time lasts will depend on your baby’s interest. Never leave the baby alone in this position, even for a second, or she may roll over and hurt herself. Likewise, make sure you are alert because we don’t want babies to fall asleep during tummy time because that is a SIDS risk just like sleeping on their tummies at night. ← How does a circumcision heal?